When we speak of dharma, we usually refer to the teachings given by the Buddha, but in fact dharma has two meanings: one is the scriptural dharma that came down to us from the Buddha and the other is the dharma of realization. Actually, the root of all dharma is realization, meaning that one understands the true nature of phenomena just as it is. To obtain such understanding, one has to develop all the good qualities of meditation with much diligence, effort, and perseverance. Through this work in meditation, one comes to a point where a very special understanding, knowledge, and insight never experienced before arises. At this time one reaches the ultimate fruition, true realization. This is what is meant by the dharma of realization. But in order to achieve this realization, we need a foundation to work from. We need to work from the scriptural dharma which is the dharma as a teaching given us by the Buddha. There are two main classes of scriptural dharma: the teachings of the sutras and the teachings of the tantras. The sutras of the Buddha were given in three different waves or turnings of the wheel of dharma. The first turning of the wheel of dharma were the Hinayana teachings. These teachings were intended for individuals whose mind was not yet very open and had a lesser aspiration to achieve enlightenment. The second wave of teachings called the second turning of the wheel of dharma are the teachings on emptiness and on the Prajnaparamita teachings. These are teachings of the Mahayana. Finally, the third wave of teachings were the bridge between the sutras and the tantras. These were the teachings in which the Buddha taught that absolutely everyone has Buddha-nature or Buddha-essence. Now the first turning of teachings were given in Varanasi which you can visit in India nowadays. The Buddha taught in the deer park (which is now called Sarnath) which at the time was a very remote and very solitary place.6 After the Buddha reached his enlightenment, he remained completely silent and didn’t teach for seven weeks. The reason for this was to show that the dharma is very rare, very special, very valuable, and this is why the Buddha just remained silent for some time and until he was requested to teach. The request was made by many gods including Brahma. Having had the request to teach, the Buddha went to Varanasi and gave the teachings in the deer park. He gave the teachings to five men who were called “the five good followers” who were connected by previous karma to the Buddha and who through this link, were the first ones to receive his teaching. He showed that if we don’t practice the path of dharma, we will wander on and on in samsara, but if we practice the dharma, we will gain the liberation of nirvana. The Buddha first taught that suffering is inherent to samsara and that this is what we must really overcome. Secondly, he taught that the cause of this suffering are the disturbing emotions (or kleshas) and karma. To counteract samsara we must engage in the aspect of nirvana which again has two parts. The third noble truth of cessation or peace shows what we can achieve. Nirvana is cessation of suffering. And fourth the way to achieve this is the truth of the path. Since samsara is by nature suffering, we have to go beyond samsara to eliminate samsara. Since nirvana is peace, this is what we have to try to achieve. But achieving nirvana and eliminating samsara can not be done automatically. So it is done through working on the causes of these that we can achieve our goal. This is why the Buddha expounded on the four truths in the form of causes and their effects. The causes of the suffering of samsara are the disturbing emotions such as lust, anger, and ignorance and karma which need to be overcome. In the same way, the cause of peace and bliss of nirvana is the path which needs to be practiced. So this is how the Buddha gave the whole outline of his teaching in the form of these four truths. Within each aspect of samsara and nirvana, there is this causal relationship between cause and effect. This series of teachings which began in Varanasi were called the turning of the first wheel of dharma. Later the Buddha taught the second wheel of dharma at Vulture Peak in Rajagriha, India. The people who were present during this teaching were arhats and bodhisattvas in great numbers. The teaching itself was mostly the exposition of the Prajnaparamita. This is when the Buddha gave the teachings on emptiness and on the conduct of a bodhisattva through the teachings on the six paramitas. In the first turning of the wheel of dharma, the Buddha showed that one had to abandon samsara to achieve nirvana. But how is this possible? Does it mean that we have to go on a long journey to where we have never been before to find nirvana? Does it mean that we have to create something new called nirvana? In fact, it doesn’t mean that at all. All it means is that we have to understand the actual nature of phenomena10 that we have to understand that our present view of reality is mistaken, and we have to remove our impurities. And once we see things as they really are, this is when we can achieve Buddhahood. The third turning of the wheel of dharma is also called the teachings that gave complete clarification. These teachings were given in Shravasti and other places in India in the presence of all the great bodhisattvas. These teaching revealed that Buddha-nature is present in the mind of all beings. We may wonder why this was taught last. The reason is that in the second turning, the Buddha taught that everything was empty of inherent nature. This teaching could lead to the belief that the goal of the Buddhist path-nirvana-is actually simply complete emptiness or annihilation. To avoid this mistake, the Buddha gave this third set of teachings showing that the mind is not just nothingness. When one achieves Buddhahood, the original intrinsic luminosity of the mind becomes manifest. This luminosity or clarity of the mind means that the mind is not a dark, obscure thing by nature, but it has its own inherent, intelligent clarity. Once one has removed the veils, the thick shroud of ignorance, the inherent clarity of the mind, this brilliance of the intelligence of mind, will shine in its fullness. Once this clarity of the mind has manifest, then one can understand all things of nirvana and samsara very clearly. One has the understanding of phenomena and this knowledge is accompanied by the greatest of bliss and peace. These teachings were given in many places. Sometimes the Buddha gave these teachings in some of the god realms such as Tushita and some of the teachings were given in physical places in India. Those receiving these teachings were bodhisattvas and dakas and dakinis practicing the secret mantas. The sutras already provided very deep and vast teachings on the nature of phenomena. But with the Vajrayana, the Buddha was able to give people the possibility to achieve the fruition of the Buddhist path very quickly and without major hardships. 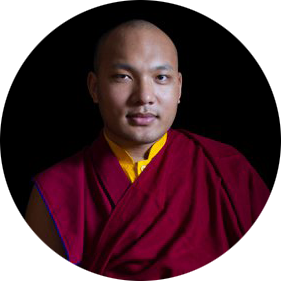 The Vajrayana can do this by providing special skillful means such as the meditation on the generation stage and the completion stage of a deity,12 and using meditation techniques of looking at the nature of the mind directly. So the Buddha turned the wheel of dharma and gave all the various teachings of the Hinayana, the Mahayana, and the Vajrayana. in different places with different people and at all different times. But also because he was teaching students of vastly different abilities, at times it seemed to them as if the Buddha was mainly spreading the Hinayana; at times it seemed to them as if he was teaching the Mahayana and sometimes as if to the Vajrayana. Of course, this was just a matter of the way in which the people were perceiving the teachings of the Buddha; it seemed to some that the Buddha was giving completely Hinayana teachings and to others that he was giving completely Mahayana teaching. The Buddha could also be somewhere else and through his miraculous powers giving other teachings to others. It is a mistake to identify the Buddha as an ordinary person and to start thinking that maybe the Buddha didn’t have complete knowledge, or was not able to teach a complete range of teachings or that the Buddha could have taught in this place, but not in that place. It is not worth entertaining such doubts because the Buddha was not an ordinary person nor was he a god who if pleased with you will send you to heaven and if displeased throw you into the hell realms. But at the same time, saying the Buddha is not a god doesn’t mean that we should think of the Buddha as someone devoid of any special qualities of knowledge, intelligence, and understanding or without any special direct intuition and insight. He was indeed a very special being who gave the complete set of dharma teachings which were not in contradiction to each other. Each has its own relevance. Whoever practices a teaching of any level or vehicle properly will be able to achieve the respective result of that particular path. The Buddha could have remained in our world for thousands and thousands of years, and this may have been quite beneficial. On the other hand, there would have been the danger that people would start thinking that the Buddha was permanent which could generate all kinds of misconceptions. Instead by passing away, the Buddha showed that if he had to die, then, of course, everybody else would have to also die one day. So it was to make everyone aware of the impermanence of life so that they could generate a sense of renunciation, a sense of urgency in the practice, a sense of weariness with this world. It was also to instill the feeling that dharma, the teachings of the Buddha, is very rare, very precious, and very valuable. So this is why the Buddha passed away in Kushinagari in India. Why did the Buddha come into our world? The reason was the very exceptional compassion of the Buddha wanting to help all beings and to lead them onto the path that leads to real happiness. He wanted to show individuals the path to peace, the path to true happiness by teaching the four truths or the two truths that describe the true nature of everything. He showed us that we can have the choice to choose our own happiness and travel on the path that leads to ultimate liberation and happiness. So the Buddha because of his very great love and compassion for all of us, did not keep these teachings to himself, but turned the wheel of dharma. After the Buddha passed away, his teachings were preserved without any alteration or without any loss by means of three great councils. The Buddha didn’t speak from books that he had written and he didn’t write anything down. Instead people came and asked him questions and voiced their doubts and their uncertainties. The Buddha would answer these questions, so that the teaching of the Buddha were actually answers to various people’s questions and doubts. These questions would become the opportunity for expounding the truth, for speaking of the true nature of everything. We may ask, “Well, if everything was just said by the Buddha and nothing was written down, how come things didn’t get lost or altered or modified as time went on?” The reason this did not happen was that many of those who were receiving the Buddha’s teaching were monks totally dedicated to the path of the Buddha. When they listened to the teaching, they did it with all their heart and immediately put the teachings into practice so they realized the fruition of the path extremely quickly, allowing all the qualities of intelligence to rapidly blossom in them. Among other things, they achieved the power of perfect memory which means each word the Buddha said was engraved very deeply in their memory so that every word was kept in their minds and nothing was lost. After his passing away one of the Buddha’s most important monks named Mahakashyapa gathered 500 arhats for a great council to keep all the teachings in tact. The meeting took place in the great Banyan cave which was on the bank of hot springs which are quite close to Vulture Peak near Rajagriha. So these 500 arhats gathered there and the meeting was presided over by three of them in particular: Ananda, Mahakashyapa, and Upali. They recited every word of the Buddha that they had heard and each of these three expounded on particular aspect of the teaching of the Buddha. So Upali expounded the Vinaya teachings, Ananda the Sutras, and Mahakashyapa the Abhidharma. They would begin by saying, “Thus have I heard. This is how the Buddha spoke” and then they would recite everything they had heard. In this way, they established very clearly and formally what the Buddha’s teachings were, so that from that point onwards all the teachings were classified into these three groups and kept very systematically. Well, we do not need to entertain that kind of doubt because the arhats were very great beings who respected the Buddha’s teaching so deeply, that they wanted to keep the teachings very pure, as they had been delivered originally by the Buddha.